I am writing on behalf of Krista Hampton, my wonderful wife and mother of our children, Tyler (14), Emma (10) and Andrew (6). Krista is 41 years old and is the rock and strength of our family. She is the daughter of Dave and Berta Johnson and daughter in law of Terry and Sue Hampton. She holds us together with all the activities our children are involved in and my crazy work schedule. She also works full time as a Physician Development Specialist at Bronson Hospital in Kalamazoo. She loves her job and all our kidsâ€™ activities while keeping our family together through our hectic daily lives. A year and a half ago, our world was turned upside-down when Krista was diagnosed with Multiple Sclerosis (MS), a neurological disorder that affects the central nervous system and disrupts the communication between the brain and the rest of the body. Unfortunately, Krista is struggling with a fast-progressing form of MS and has had little to no success in her treatment so far. Since diagnosis, she has been battling fatigue, headaches, and tingling and numbness in legs, arms, and hands on a daily basis. It is very hard to see someone you love battle through this every day while trying to keep up with three active children and a challenging career. Somehow, Krista still holds us all together. We are blessed that Krista has been included in a stem cell transplant program at Northwestern Memorial Hospital to take place this summer. This will require relocation to Chicago for much of the summer during the transplant procedures. While we are fortunate to have insurance, there will be many out of pocket medical and relocation expenses that must be covered while we are in Chicago for Kristaâ€™s stem cell transplant. To ease the financial burden, a fundraising campaign in Kristaâ€™s honor has been established with HelpHOPELive, a nonprofit organization that has been assisting the transplant community for 30 years. All donations are tax-deductible are held by HelpHOPELive in the Great Lakes Stem Cell Transplant Fund, and are administered by HelpHOPELive for transplant-related expenses only. Your contribution would be greatly appreciated. 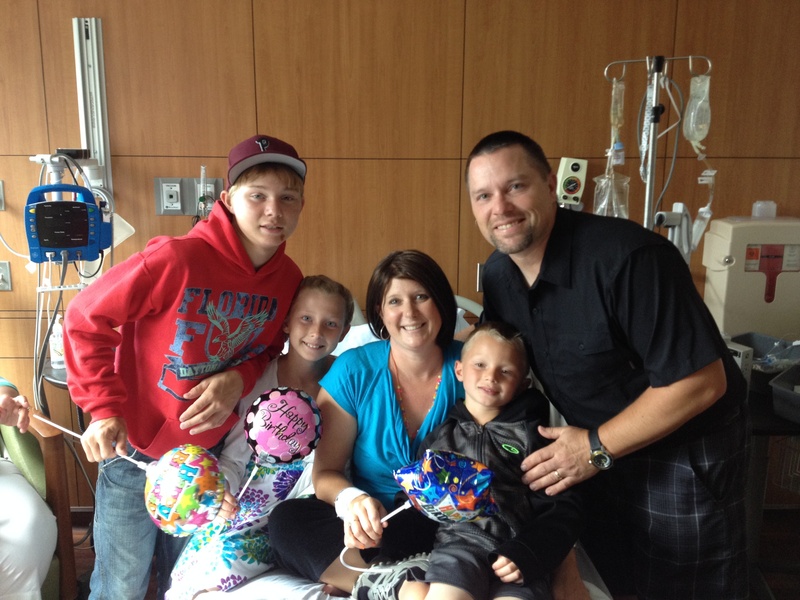 During a time like this, we ask for your support to help Krista through a successful treatment. Thank you for your thoughts, prayers, and generosity. Well it is over 2 weeks since I was discharged from Northwestern and have been slow to post. I have been recovering since last Wednesday at my parents and doing fairly well. Unfortunately, August 1st- I did end up with a set back of an allergic reaction to the medicine Bactrim. Had high fever and painful sores and round up over night at Bronson. Thankfully there was not an infection and was released after one night. Hard to have the set back and it has taken me over a week to recover from this but now feeling great! Actually, able to enjoy some family times in the UP and walk and see Fayette and Big Springs. I still feel so blessed to be feeling this well after my transplant! And living my life again! Yahoo!! Labs from yesterday showed my white blood cell count went from 1.0 to 5.1 which is actually within normal range!!! My docs in Chicago were very happy to see this and expect it to keep improving! Still being extra cautious to not get any illness but feel great. Trying to still get some rest time each afternoon. Feel better than I have since being diagnosed in 2012! White blood cells at 1.0!! The magic number!! Discharged at 5 pm cst and somehow had no traffic issues leaving Chicago! Almost home and so ready to start my new life free of MS!!!! Thank you for everyone’s love and support during this journey!!! We are so blessed! Day +10!! Well today may be the day for discharge!! My white blood cells took a nice jump overnight to .4 and they want them > 1. They are going to recheck me at 3:30 cst stat lab and hopefully it will be up to get me out of here! I have been told once the increase starts they go up quick!! Fingers crossed! Again, this entire process has been so much easier knowing I have had all of your love, prayers and support!!! Hopefully update the good news this afternoon ! Today is +9! Just waiting another day for those stem cells to let loose! We have a good feeling tomorrow will the day based on a few other indicators. My NP will be coming by this afternoon to review discharge instructions in case we can go home tomorrow. Can’t wait!!! Pictures have been added along with one with Dr.Burt and myself! Amazing physician!!! Fingers crossed tomorrow is the day! Day + 8 and just in the waiting mode for my stem cells to release from my bone marrow (engraft) and then my labs will go up and then discharge. Had a migraine earlier but better now and feel great! The website is still having problems uploading photos but will add photos once they fix it!!! Counting down…. My hope is for Friday! Day +6. Feeling good today. Needed some platelets and fluids but all very normal at this point. Hope by day +8 (Wednesday) hopefully will see the surge and then when WBC is at 1.0 discharge!!!! Counting down. Just added some new pics in the album with my wig and new bandeau!!! Another great day and night!! Just waiting for those stem cells to be released. Feel better than I have for months and have a zero immune system. Counting down… New labs have been posted in photos. Maybe tomorrow we will see the labs start increasing which means me getting closer to discharge. A great Saturday so far. All things still continue to be exactly where they should be at. More energy every day. I have updated the recent labs. We started the neupogen shots again, to help stimulate the release of my new stem cells which is per protocol. My immune system is ZERO. Clean and ready for the bone marrow to release my new cells. This may be a 2-3 day process. It will be interesting to see my labs change daily! Thank you again for everyone’s messages, love, prayers and support!!! We read them daily!! Yeah another day and doing great. Tomorrow may be the day my bone marrow lets loose of all my new stem cells (that’s what the labs tell us today) and then my labs & energy will start to climb back up! Countdown is on!! I just added a picture of my “Bone Marrow Recovery” chart. This will show the decline and then progress of things like my White Blood Cell count. We want this to be 1.0 or higher so we can go home. We hope this is around day 10 (July 25). This is in the “Stem Cell Transplant” picture album. I’ll try to update this daily. I’m feeling pretty good and getting lots of rest. Day +1 is going good. I feel really good, except all my family had to leave today. My care team is closely watching labs and everything is right where it should be at this point. Not much will happen until day +4 when I start medicine to stimulate my immune system. We hope that around Day +10 (July 25) we can go home. Transplant Day!! !Well the 23 million and counting stem cells were blessed and have been given back to me free and clear of MS! It took about 30 minutes but was full of emotion, joy and praise!! Amazing feeling to be onto recovering. We expect my immune system/WBC to shoot to about zero in the next few days and then there will be nice surge. Hopefully by day + 4. ( Saturday) thank you for the daily thoughts, prayers, and support. It means the world to us! New pics will be added!! My new birthday is today! It’s day zero and I just finished my stem cell transplant. My family was there, my cells were blessed, and my health care team was there to help celebrate. I’m feeling good and very excited to let my stems do there magic to zap MS. Thank you for everyone’s prayers! They are in action and working side by side with the awesome care givers I have. Day -1 (minus 1) is here. It’s going to be a great day today! My doctor’s transplant team visited me this morning and things are going quite well. My family is visiting today and I’m very excited to see them. My kids, parents, sister, and in-laws will be here today and will be with me for my “new birthday” tomorrow. For the first time since being admitted, I’m not hooked up to all the cords and fluid lines this afternoon. It made my walk a lot easier. My stem cell transplant is scheduled tomorrow at 10:00 am (central time). 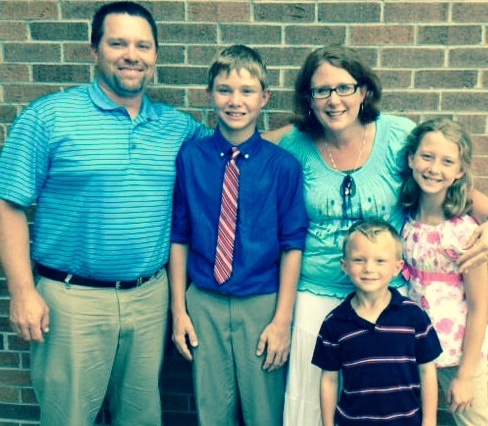 A pastor will bless my cells prior to the transplant, but I’d love your prayers too. Day -2 (minus two). Only two days away from my stem cell transplant! It’s my last day of chemo. I exercised today and went for a walk. I’m looking forward to visiting two good friends today. My oldest son and father-in-law visited yesterday too. My parents, in-laws, and kiddos all come tomorrow to share the big day on Tuesday. So far I’m doing great and anticipate a successful stem cell transplant! Thanks for all your thoughts and prayers! See my picture getting my walk in today. It’s in my Stem Cell Transplant photo album. Dealt with severe headache last night. Doctors have new plan in place to combat headaches. Feeling pretty good today and went for a walk. Saw great views of Lake Michigan. Another round of chemo starts at 3pm. Today I was admitted bright and early. I have a beautiful view of the city. My meds are all running including chemo. Lots of anti nausea meds on board to help. Finally it was time to get rid of the hair so I got over that hurdle today. Bald is beautiful right??? Next four days of chemo and countdown is on for 7/15 Stem cell transplant!!! Well today we head back to Chicago to start phase 2. Very hard to go but I know this is what needs to happen! I get a port placed in my arm today for the drs to use for chemo and other meds. I will be admitted tomorrow morning for the long haul with chemo x 4 days and then my stem cell transplant will be on 7/15. I or Tom will continue to update daily. We appreciate everyone’s continued love, prayers, and support! 23.5 million stem cells !!! Yeah! I am just thrilled and ready to rest and relax in Gladstone/UP for a week with family. Back to Chicago on 7/9 and start the process for my stem cell transplant on 7/15 with fresh, clean, free of MS stem cells!! Stay tuned…. Harvest day of stem cells! Hooked up to the machine and see my stem cells! The prediction from lab work was 17 million!! I needed 2 million. We will get final count when completed. I added a picture to the album of me and my machine! Had a wonderful day with my kiddos. My parents brought them for a day visit to Chicago. I was able to rest while Tom and my dad took them to Millennium park for a while. So hard to say goodbye again to them. Tomorrow will be a rest day before our early Monday am report for the port placement and the 4-6 hr harvest of the stem cells. It looks like a large dialysis machine I will be connected to. Hopefully tomorrow will be a good day and will keep praying the stem cells will be there in the millions! After a very nice visit from my childhood best friend Kara, Tom and I went up to the hospital for lab work. Found out my white blood cells are now 1.0 which is to be expected from the chemo. I will be staying inside until Monday morning until the harvest of stem cells! Lots of antibiotic wipes being used now. Well I started the neupogen shots this morning. 2 shots at a time and after a pep talk from my sister Susan, mission accomplished. Will do these for the next 5 days and hopefully by Monday morning I will have millions of stem cells to be harvested! I understand bone pain will start soon, but that just means more stem cells! Also my dr told that by Friday my immune system will be compromised from the chemo last week and I will need to stay out of crowds. So today we took advantage of the sunshine and my health. My mom treated my sister and I to a beautiful riverboat cruise of Chicago today. It was so nice to be out in the fresh air and it was very relaxing. Tom will come back tomorrow morning. I am working on thank you notes and a huge thank you to the anonymous donors!! Thank you all for your conditioned love and support! Well a quick trip downtown today to the blood center at Northwestern Memorial hospital. They did a quick check of me and showed us where I will be on Monday to harvest my stem cells. I will first get a port placed and then hooked up to the machine. They said it would take 4-6 hrs to get them. Susan ( my sister) did a great job driving us right downtown to the appt. Neupogen shots start tomorrow at 7 am so prayers to get those stem cells to grow!! Glad to hear you are back on the recovery road. Praying for you daily. So happy you are home...rest! Wonderful wonderful news! Such good news. So glad you are feeling good. Wonderful news! Welcome home, Krista! You are on a miraculous journey and have a wonderful story of hope, joy, recovery, and God's goodness! Glad to hear you are feeling better than you have in months. That is what you were hoping for! Know that you can feel all the prayers. Church FUMC joined together in prayer yesterday. So glad you are feeling better and know you are anxious to see the end of this thing. Hope counts start today. May it be a great Monday. Krista and family, So thankful you are doing good. Prayers are being answered. Praying you can go home on July 25 that would be wonderful. Take care prayers and thoughts are you and your family day and night. So glad to hear it is going well. We keep thinking about you here at work and sending good thoughts and prayers. Thanks for the updates. Hi Krista, You look great in scarves :) We are keeping you in our daily thoughts and prayers! Hope you can concentrate on doing something you never have time to do.....like read a good book, nap? So glad to hear the transplant went well.....we'll keep praying for that white blood cell count! Take care!! Krista, you are amazing! I am so happy to read all of your posts and see that things are going well. We have been praying and thinking of you all the time. Keep moving forward, you have come so far. We are sooo happy for you!!! Continued prayers and thoughts from all of us. Krista, sending prayers and positive energy as you start to heal. Happy New Birthday! I am glad to hear all continues to go well. You look beautiful! Know that at 11:00 our time all clergy and staff paused for prayer. We were sending love to you too. Krista: Thinking of you today, logged on and realized today is your big day. Will pray for a successful transplant and great recovery. Krista - the day is finally here! Your strength and courage have brought you here along with your tremendous faith. We will be lifting you up in prayer at 10 and celebrating what you are embarking upon. Love ya girl... To all your family there with you - thank you for your wonderful support of Krista, without all of you her journey would have been so much harder, praying for all of you as well! Today has finally come. May it be the best birthday EVER. I'll be at church at 11:00, 10:00 your time praying for you. Krista-our thoughts and prayers are with you and your family. Have a wonderful "new birthday!" Will any new endeavor ever intimidate you again after sailing through this?? I got kind of scared when I knew you were in chemo, had had headaches, then didn't see a post the next day. Thought you might be experiencing a bit of chemo "hell". Silly me.....nothing has kept you down for more than a minute or two in this whole ordeal. Tomorrow will be a big day......"Happy Stem Cell Transplant Day"......Hmmm, I wonder if they have a big balloon that says that??? If not, "Celebrate" will do. Love the scarves! You are in everyone's thoughts and prayeres here at Bronson. Not a day goes by that someone doesn't ask how you are doing. Here's wishing for a great transplant day tomorrow! Hi Krista - I just wanted to let you know that I am thinking about you and sending lots of positive and healing thoughts your way. You are awesome!! I'm thinking of you and your family. Good things are happening, and I know through your mother, you have everything you need (plus more) to go through this. Tuesday will be a blessed day! Krista, scarf #2 wins. #1 looks like you belong with jake & the pirates! I will look for a nice leopard print scarf. I'm thrilled things are going well, keep up the good work & good spirits, very important. Read your update everyday. Feel good & get healthy. entered your name in the prayer book at church today. You and Tom are in our thoughts and prayers always. Your cheerleading ability will lead you on to Victory. Go Brave Girl! I pray that all this is soon over and the MS is gone, gone, gone. I watch daily for your posts it helps me to continue to pray. Krista, I just read your mom and dad’s post from yesterday. I want to give them virtual hug, too. I can feel the love and pain in their words as they accompany you on this journey wanting to “make it all better”. A loving parent always feels the pain and anxiety of sick “child” no matter what age the child is. And, Tom, Krista is not the only strong, courageous, determined, admired person in this chapter of your married life as you share every day and step with Krista. You are, too!! As long as I’m on a song kick today….there’s always a song that makes me tear up every time I hear it because Todd, Mike, Tom, and I sang it in harmony with guitars and piano when they were home and we gathered with friends and family when music inevitably became a part of the gathering. The song is by Crosby, Stills, and Nash “Teach Your Children Well”. Ter and Sue…….you did! Tom demonstrates it every day. You must be so proud. Thank God both Krista and Tom have such loving, supporting, parents. That dark, uncertain, scary night isn’t so scary with loving arms around them. Krista, When I woke up this morning early, got a cup of coffee, sat down on my favorite spot on the sofa to ponder the day the song lyrics from a 1965 "pop" song popped into my head......"You Were On My Mind" ....haven't thought of it for years. I remember so few songs from 1965 on for the next couple of years being so busy with two babies. Must have been a subconscious prompt to turn my thoughts to you. A brief prayer "let this be a good day for Krista" ..then grabbed the computer to convey this very message to you. Day -2, and "You Are On My Mind". I don't know specifically what you're dealing with daily right now, but can only imagine. Chemo is not a feel good chemistry. My heartfelt compassion, admiration, nurturing emotions are evoked when thinking of you with the only channel of conveyance being either mental telepathy or this portal. So here is my thought for today. Words borrowed from Winston Churchill.."If you're going through hell, .keep going". -2, then onwards & upwards. Dearest Krista, We are here with you even though we aren't there beside you! I have so much admiration for you. You never complain, you never say, I can't, or never get mad! You just look towards the end and you have such strong faith that you will be free of this disease. I love you so much and pray that you will be even stronger than you have been! May God be with you my sweet. Day -3.....we're counting right along with you. Another candle lit in church for you today. Hope your day has been peaceful, side effects minimized. "God Bless and Keep You" as comfortable as possible during these last days before a new beginning. You're such a courageous, strong, determined, young woman, Krista. You've got my admiration! Our best to Tom, your kids, and family who love you so much who are, too, so anxiously waiting out these next 3 days right along with you. As with everything else, Krista, you've handled this experience so well. I can surely understand it being hard to go back after some much needed R&R over the 4th with the family. But back to the front lines for the final tour of duty.....you're almost there.... We're virtually holding your hand all the way. My goodness, girl, you must have squeezed every drop of Neupogen out of the syringe, and you must have an extremely fertile stem cell productive body.....what a magnificent stem cell count you had. Just a note about being bald.....according to my sister when she had chemo....."it's a real time saver". You'll have to get some cute head gear until it grows back to avoid sunburn this summer with your fair skin. The wig shop near the Mayo Clinic had some adorable stuff...must be lots in the Chicago area too. 'm sorry I've been absent from the internet....was up north in an internet-less location....but thought of you. Knew you were in Gladstone from Terry. My thoughts and prayers continue. Your almost to the finish line. Cheering you on. You and your family continue to be in my thoughts and prayers. Glad you got that break with your family. Will pray for strength for your stem cell transplant next week. Praying for you and your family as you enter this next phase of care. Krista, I'm praying today and the next weeks that all goes just as planned and you are back on Michigan and the MS is a thing of the past. What a great harvest!. Love the picture - you look great. Thinking of you and hoping you are enjoying a rest with family. Great to learn that your stem cell harvest was so strong. Thinking of you and your family and will continue to stay tuned. Thinking of you, Krista, and hope all continues to go well! So glad it went well. Have a great time with your family. I am thinking of you and following the blog daily. Good thoughts and prayers to you and your family. Thinking about you today and excited to see you in Gladstone after the 4th!! Krista, praying for you & your family. Be positive & strong. You have a lot of support back home from your Gladstone friends. HI Krista! Wishing you lots of success in the days ahead, will keep young our prayers!! Hello Krista, Hope this finds you making good progress in your journey today! Keeping you and your family in my thoughts and prayers. Hi Krista and family. You have been in my thoughts and prayers. I am glad to see the updates on this blog and that you are starting this process. I will pray for ongoing strength for you and yours! will you have a address we can send cards too?? Krista - discovered your blog and will stay in touch during the journey. We will both likely learn about some high end medical care on the way! So glad you had a good day and hope that is continuing. Take care of yourself and take lots of naps! We are so glad to be with you here in Chicago. You are so amazing and strong. You never complain about your condition and you are so positive with your children. May each day bring you closer to the end of MS. We love you with all of our hearts. Hello Krista! Just a quick note to tell you that you are in my prayers daily. Glad to hear that Susan is there with you. We hope and pray for a successful transplant, and you to be feeling well again soon. Love to you and your family! Krista and family, This is Mark and Randi Tolonen, John Tolonen's son and daughter in law. Susie has been keeping us up to date. We are thinking of all of you daily. Love to all !! Dear Krista, Tom and Family--You are in my thoughts and prayers as you go through this ordeal. You may not remember me as we only met on one occasion. Tom--your mom and dad and I go way back to Jeffers HS days and still remain in contact whenever we can. Sending all good wishes for all of you. Terry & I are so pleased you are enjoying a "feeling good day!" Glad Emma & Andrew are with you this weekend along with Tom, your folks & Susan. Best support ever! Love & pray for you daily. We'll be praying for you. Hope things go well and stay strong! Hi Krista, Tom, Tyler, Emma, and Andrew ~ You are all in our thoughts and prayers that God will strengthen and guide you throughout this difficult journey. Thank you for keeping us updated! Krista and Tom, thank you so much for taking time to keep us informed. We are praying for you. Thinking about you today. Many prayers and blessings are out there for you and Tom. Love you much. Krista and Tom, know that we all are praying for you that this will be a successful journey for you. You are a strong person nothing will be too much. Keep the Gradstone brave going. Krista I want to wish you the best and pray for complete success ahead. God Bless and will pray everyday for good news. Dear Krista & Family.........Keep God's presence deep within you, comforting & strengthening you, straight through to your recovery & thereafter. Still keeping you in our prayers. I know you are a very strong person and that you will fight until you win! But I am sure there will be nights when tears will flow, just try to think of yourself as that little girl held warm and tight in your parents arms and believe that around you all are God's arms. You and Tom are that for your children. If at night when all normal people are asleep and you want to talk (906-484-3649) or you want to chat I am usually up until 3 or 4 AM. I love you sweetheart. Krista, we know you and your family are going through a difficult battle. But you are young and you are a fighter. That means so much in any conflict. We are so glad you are going through this treatment and will continue to pray for its success and especially for a cure. It's all in God's hands. "I can do all things through Him who strengthens me." Phil. 4:13. Krista, sometimes God allows us to travel down a difficult path to show us how strong we are. We will continue to keep you in all of our daily prayers; and you will keep on fighting until you win. Krista and all the Hamptons, I am sending much love and promise of prayers for your healing. Krista, I think of you daily.. you are in my prayers. You are a very strong person and will get through this! Just remember that God is with you and supporting you from on high. Bless you. Krista and family, This is Nikki Ebbeler's aunt. Been thinking and praying lot for you and your family. Krista this is one fight you will win and encourage others by it. Keep focused and positive I'll continue to pray for a speedy and full recovery for you to be able to return to everything you enjoy. Scott & Carrie Groleau and family. Dear Krista and family, I grew up with your mother, Krista, so I know you have one of the best moms and supporters anyone would need. My prayers and heart are with you and your family. I'm so excited you have this stem-cell opportunity. I will pray for you. I'm sending love to all of you along with prayers. My thoughts are with you. Keep up the fight Krista! Krista....We have had you in our thoughts and prayers and want to wish you continued progress with your fight against MS. You are loved and admired by many people, including us. Krista, we send you all our love & support. You are so brave & such a fighter! We love you!! We are so proud of you. Stay strong and know that we are right beside you. We love you so much! Love you sister! Keep fighting! !